So as you doubtless already know George Zimmerman was arrested again on Monday; he just bailed out today. He faces domestic violence charges for, among other things, allegedly threatening his pregnant girlfriend, Samantha Scheibe, with a shotgun. In case you’re keeping score and counting arrest records, that’s George Zimmerman, 4, Trayvon Martin, 0, with all of George’s arrests involving charges of violence. Our understanding of what happened between Scheibe and Zimmerman is still unfolding, but the yesterday’s 911 tapes are deeply suggestive. You can hear them along with great analysis by Joy Reid and others as the first item on the archive of last night’s Last Word. A lot jumps out – not least of which being Zimmerman’s chilling sangfroid and the legal/PR savvy he demonstrates in his own call to a 911 operator. You may also notice that Zimmerman appears to be very, very well armed – his girlfriend claims he has at least two handguns, an AR, and the shotgun with which he allegedly smashed some of her possessions and furniture. It’s that last weapon that I want to call your attention to. Scheibe identifies it as made by KelTec. 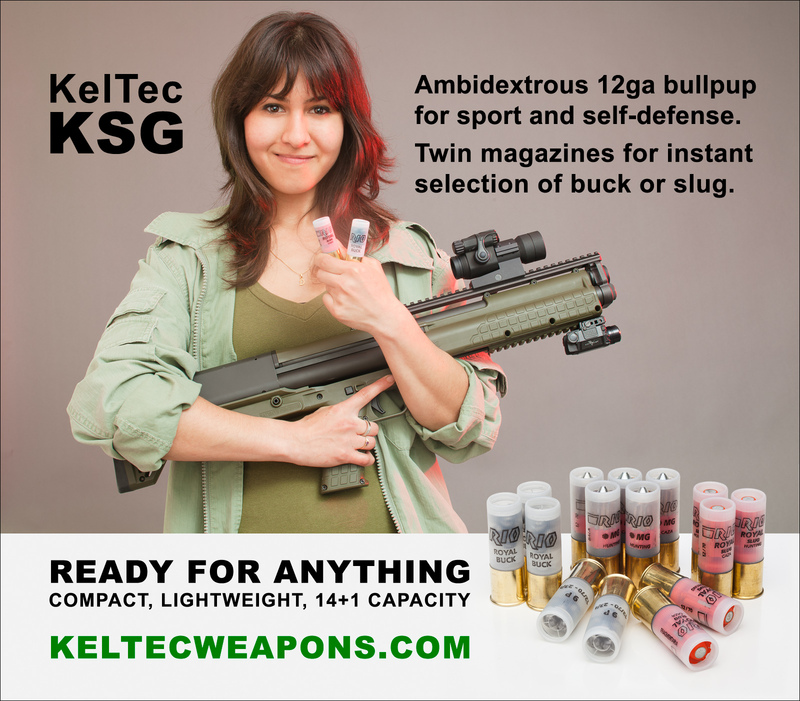 KelTec is based in Florida, and it only produces one shotgun – the KSG. The KSG is a new, futuristic-looking 12 gauge intend for tactical use – the tightly compact ‘bullpup’ configuration is designed to help the user move it efficiently through close quarters, around doors, etcetera, and this feature plus the 15-round capacity is I suppose helpful if you’re part of a SWAT team clearing a room or a civilian who fears, however implausibly, having to defending your home in an all-out firefight. At which point it’s worth nothing that since Zimmerman wasn’t able to actually hack it as a police officer and thus has never been nor ever will be in the former category, he apparently belongs in the latter, which shouldn’t be surprising to anyone at this point. Anyway, folks love them their KSGs – here’s video of someone going to town with one. You can wield a virtual KSG while playing Call of Duty. They’re so popular that they frequently sell out, and when they do sell, go for well over the initially pitched MSRP of circa $800. It’s perhaps because they can be hard to come by in this crowded market that just this past August George Zimmerman visited the KelTec plant to inquire about acquiring one – and apparently received a guided tour of the grounds from the owner’s son. He also mugged for photos with KelTec employees. This brings me to some questions. First, did Zimmerman acquire this shotgun during that visit – was it perhaps even given to him as a gift by KelTec? Did a KelTec employee – perhaps even the same bigwigs who feted him while there – sell it to him? You can transfer guns to people with incredible ease in Florida – did some kind of transaction of that order happen here? Second, even if Zimmerman didn’t receive the gun with which he allegedly threatened his partner directly from anyone affiliated with KelTec, what, combined with the visit in August, does this latest development say about KelTec – what might it mean in PR terms? What kind of endorsement was KelTec looking for when they let Zimmerman gladhand for photos in their plant – and what did they endorse when they let him in? And here’s my third and last question. What does it mean when an alleged domestic abuser and indisputable child killer becomes the poster child for a company that elsewhere tries to pitch ads like this one? This entry was posted in Uncategorized on November 20, 2013 by Pat Blanchfield.